I couldn't wait to get out of high school, not because there were cliques or mean girls or whatever (in actuality, I had a much harder time in middle school with all of that anyway, by high school, I had pretty much figured out how to hide in the crowd and not be bothered) but because high school, for me, was just an exercise in futility. A way to get out from the under the watchful glare of my father and a way to still be a teenager instead of the constant caretaker of two much younger brothers. High school and the opportunities to escape were all just a key to get out into the real world and away from home as quickly as possible. When I received the book, Here I Go Again by Jen Lancaster, I was initially very excited, especially after having recently finishing The Willpower Instinct and all of the heaviness that comes with self-help and changing thought processes. 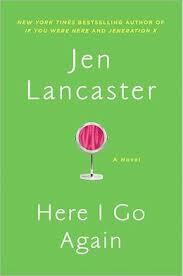 I needed something lighter, something funny, a good book that would let me focus on something other than my crazy life. Unfortunately, Here I Go Again, didn't really give me what I wanted initially. Lissy Ryder was the prom queen, the head cheerleader, a self proclaimed Jennie Garth (90210!) look-a-like. She looks down on almost everyone, except for, apparently, Oprah, doesn't do her job at a PR firm, preferring instead to stay at the gym being critical of anyone that comes into her path. Her husband, Duke, is the same on and off again guy from high school. I was just about to put the book down and walk away when Lissy's credit card gets rejected at the gym, her husband announces his desire for a divorce at dinner, and the precious world that she has built around herself begins to crumble. Fast forward a month and Lissy is swimming in credit card debt, jobless, divorced, and living in her bedroom at her parents house that is a temple to the prom queen cheerleader that she once was. This is about people that can't move on, that don't grow up. I am very familiar with these people. The people who think that their best days, their glory days were in high school, that they should be taken care of, coddled, and protected from the unfairness of life the same way that they were in high school. And twenty years later as the world crashes around her, Lissy Ryder finally realizes it is time to grow up. The book had some great funny moments, there were times that I felt like the dialogue was bit overworked (Lissy and her friends speak as though they are stuck in the grown up version of Clueless), but it is definitely a great book to take with you on the upcoming Spring Break beach trips with the kids. If you would like to join the conversation over at BlogHer, we will be discussing Here I Go Again for the next 4 weeks! This is a paid review for the BlogHer Book Club, but all opinions expressed are my own. Ask A Man: What About The Dishes?